How to get the latest build of Parallels Access? To update Parallels Access on your iOS or Android device, visit App Store or Google Play respectively. 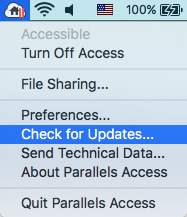 To update Parallels Access on your Mac, click on the Parallels Access icon in the Mac menu bar and select Check for Updates. To update Parallels Agent in Windows, click on the Parallels Access icon in the taskbar and select Check for Updates.